Acinom, ZestfullyBling, KaeKae and 17 others like this. 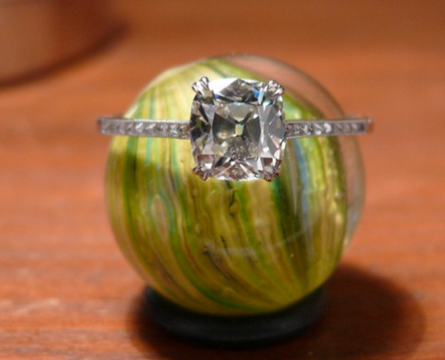 I love the setting you chose for this stone. Where did you find the setting? My gray green diamond. It's hard to get a picture of the rainbow of colors that this stone generates, but I think I was finally able to capture them with my camera. I know that this post is two years old but I cannot stop dreaming about this ring. It is just so uniquely stunning! Did you search for such a different colored diamond or just come upon it? Was it already set in its beautiful setting? Also if for whatever reason you ever decide to sell this baby, I would love to stand in line. I wear it almost everyday. I have several diamonds this color in rose gold, but this is the largest at 2 carats. I just came upon this color because they’re typically much more affordable than other colored diamonds. It’s like a fancy yellowish grayish green. The rose gold really brings out the green. Here is a new pic taken the other day with sun light beams. Hivona, GeauxGirl, 2Neezers and 6 others like this. Tanzanite (1.97carst) in Tacori setting. 2Neezers, KaeKae, KLC and 8 others like this. Beautiful, I love Tanzanite, just be a bit careful with it as it’s not as durable as a diamond. Gorgeous!! I really love that shank!! She is a beautiful. I really like the setting too. It screams elegance to me. The tanzanite has great color and I love the cut too. Thank you all! I don’t wear it often as tanzanite is not as hard as a diamond. It’s so rainy today. Rubellite tourmaline. Not the best color or clarity, but I love how huge it is. Deathspi, Bluegemz, elle_71125 and 7 others like this. Wanted to say thank you to the Pricescope community as reading here helped us learn so much about gemstones & create my dream ring! Sapphire is from Blaze & Shelly at Blaze-N-Gems. KLC, kgizo, blingergrrrl and 11 others like this. kgizo, Rockcollector, Acinom and 15 others like this. This is my dream stone with my dream cut. Its just so pretty and perfect! I really like the trillons on the sides. Gosh this is gorgeous! Post pics on hand when you finally get your ring! kgizo, blingergrrrl, Acinom and 11 others like this. Holy smokes. That is perfection. The blue is luscious and velvety and wonderful. I know that I can occasionally gush like a school girl but this deserves all the gushing I can muster. Well done you!!! It's stunning!!! Such a gorgeous color and such a gorgeous shape! Congratulations! Wow. kgizo, 2Neezers, GeauxGirl and 4 others like this. aac2013 and GardenLady21 like this. JrJ, lambskin, MrsKMB and 19 others like this. MeowMeow, kgizo, pwsg07 and 5 others like this. MissyBeaucoup, kgizo, scouty and 5 others like this. Jomana, kgizo, 2Neezers and 5 others like this. MissyBeaucoup, leslie1956, scouty and 5 others like this.